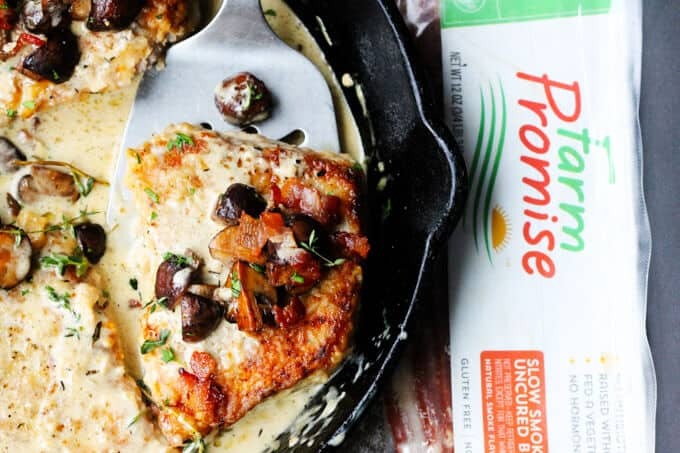 This post, featuring delicious Pork Chops in White Wine Cream Sauce with Seared Mushrooms and Bacon Bits is sponsored by Farm Promise, a company that produces all natural no-antibiotics-ever pork. 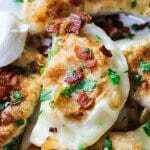 This is a low-carb, easy to prepare and flavorful dish that combines: boneless pork chops, white wine, garlic, herbs, and cream. It can be ready in as little as 30 minutes. When I was growing up back in Poland pork was a staple of my diet. In fact, I think that pork is the most popular type of meat in Poland. Every Sunday, you’d hear the chorus of moms banging their pork cutlets in the kitchen to tenderize it for breaded cutlets. This was the most popular way of preparing pork for kids. This seemed to be a win for moms and kids alike. Reason being, because they’re delicious and nutritious – lean protein is an excellent protein choice for a balanced diet that every kid (and adult for that matter) needs. As an adult, I’ve extended my appreciation of pork beyond just breaded cutlets. Yet, because of this love for breaded pork cutlets, I’ve developed a special relationship with pork chops. 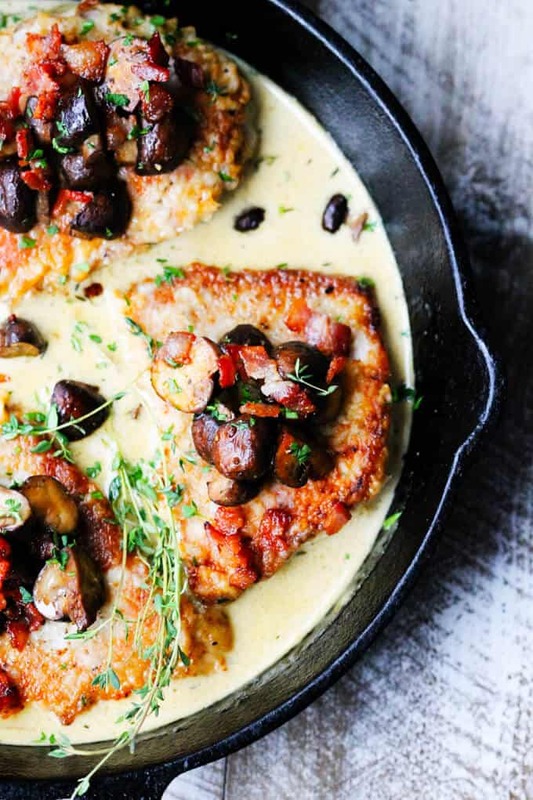 And it’s because of this reason that I’ve decided to use boneless pork chops in this amazing recipe for pork chops in white wine cream sauce. You’ll see, the addition of sautéed mushrooms and bacon bits really elevate this dish. These sautéed mushrooms remind me of the ones my mom used to make. And bacon…let’s be frank here, everything tastes better with bacon. The only thing I really struggled with when moved to New York, was finding good quality pork. It’s because of this very reason that I ended up not making pork dishes as often as I’d like to. That’s why I was so excited when I was turned on to Farm Promise in my local ShopRite. All the pork is born, raised and harvested here in the U.S.A.
And last but not least, it tastes super delicious. Now let’s talk a little bit about the recipe. I prefer bone-in pork chops for dishes from the grill or simple chops with the glaze, but I prefer boneless pork chops for dishes using a sauce. 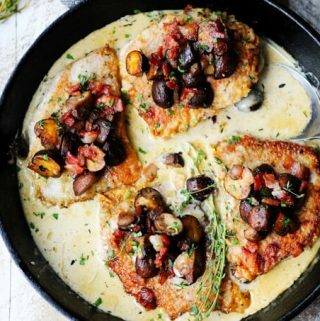 This white wine cream sauce is so decadent and delicious that you’ll just want to slice through your succulent meat and smother it in this sauce. That’s why Farm Promise Boneless Pork Chops are perfect for this dish. The next question you may ask is which ones are better for this recipe: thin or thick cut boneless pork chops? 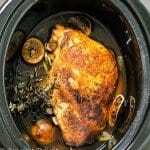 Pork cooks very quickly; therefore I prefer a thick cut for this recipe. Here is my secret to perfect, tender and juicy pork every time: BRINE IT. I use a simple solution of 3 tablespoons of kosher salt + 3 cups of water and then I brine it for at least a half hour. You can let it brine even up to 4 hours before cooking but a half hour is a must. Here’s how I prepare my brine. I boil the water and dissolve the salt into 1 cup of hot water, and then I add ice cubes to cool it off. Once the ice cubes are dissolved I then add the remaining water and mix it. Then I put my chops into a large Ziploc bag and pour the brine over them. Then zip it and place the whole bag into a big bowl. If you do this a half hour before cooking your pork chops, then just leave it on your counter. You don’t want your meat to be super cold when you start cooking it. If however, you’re brining your meat for a couple of hours, then use your fridge to ensure your meat stays fresh and then take the bowl out of the fridge a half hour before cooking. I used quick dissolving flour to coat my pork chops because I like the crust it creates. But you have the option here to either use all-purpose flour or make it gluten-free and skip the flour all together. You’ll then want to sear your pork chops on medium-high heat for about 4 minutes on the first side until it’s golden brown, then flip it and cook for an additional 3 minutes. Then you remove those chops out, as they will finish cooking in the sauce at the end of the process. The objective here is to make sure that your pork chops internal temperature is at 145F when done. This white wine cream sauce is out-of-this-world delicious! You’re using the same pan as you seared your chops in, so the flavor is already there. Aromatics like garlic and dried thyme add the complexity to this humble sauce. 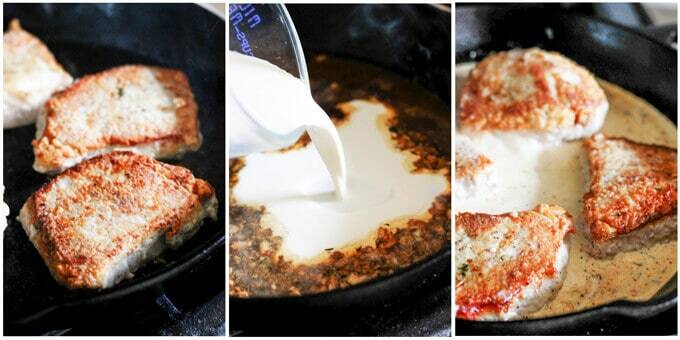 White wine will deglaze your pan and the cream brings it all together. If you don’t want to or can’t use wine, you can still make this recipe. Instead juice half a lemon and add half a cup of chicken stock. (I wouldn’t recommend this wine substitute for drinking purposes). If you’d like to lighten up this recipe, use half and half instead of heavy cream. Should your sauce be thinner, then you can mix 1 tablespoon of flour with some water and add it to the sauce to thicken it up. 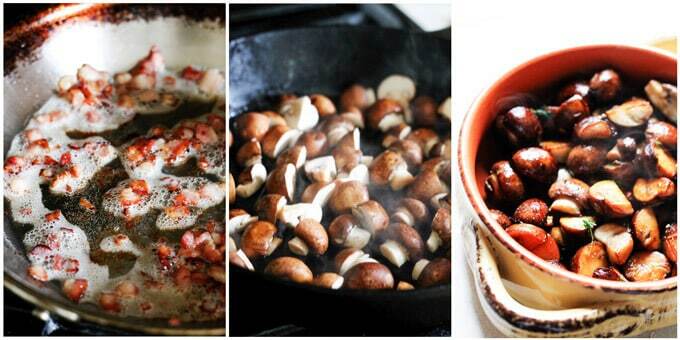 Adding mushrooms and bacon to the top of your chops and …serve. These steps are very easy, you can see them featured in the photos here and below you can find printable recipe. 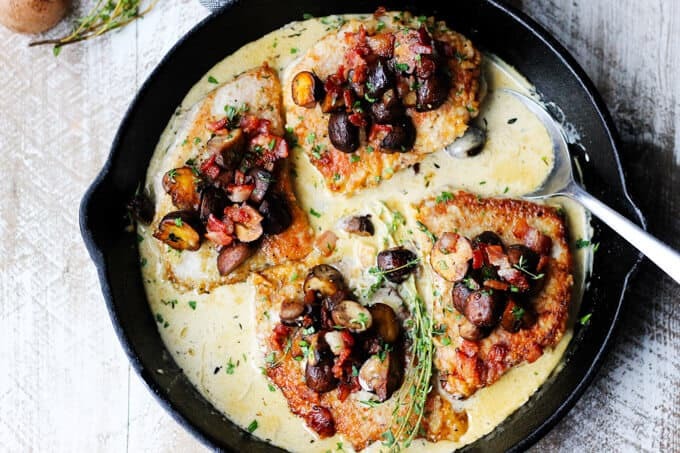 If you want to make this recipe, head over to your local ShopRite and purchase Farm Promise Pork Chops and Slow Smoked Applewood Uncured Bacon and then you’ll be one step closer to this awesome Pork Chops in White Wine Cream Sauce. Enjoy! 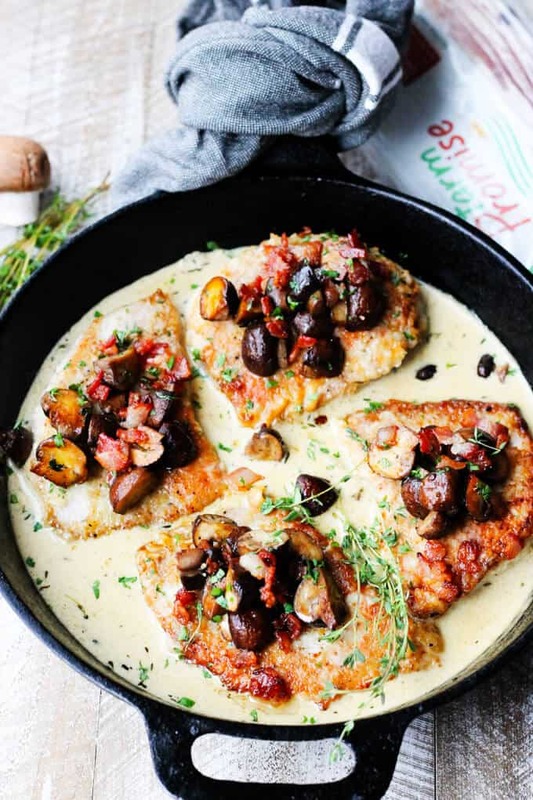 This Pork Chops in White Wine Cream Sauce with Mushrooms & Bacon is a low-carb, easy to prepare and flavorful dish that combines: boneless pork chops, white wine, garlic, herbs and cream. It can be ready in as little as 30 minutes. Dissolve salt into water and bring to room temperature; add pork chops and brine for at least half-hour. If brining for more time, place chops in brine and then into a refrigerator. Take out from the fridge a half hour before cooking. Wash, dry and cut your mushrooms; heat up butter or ghee and then add your mushrooms. Do not add salt and do not move the mushrooms for about 5 minutes, in order to get a nice sear; after that, mix the mushrooms and add salt and pepper and then cook for another 2-3 minutes; remove from the pan. 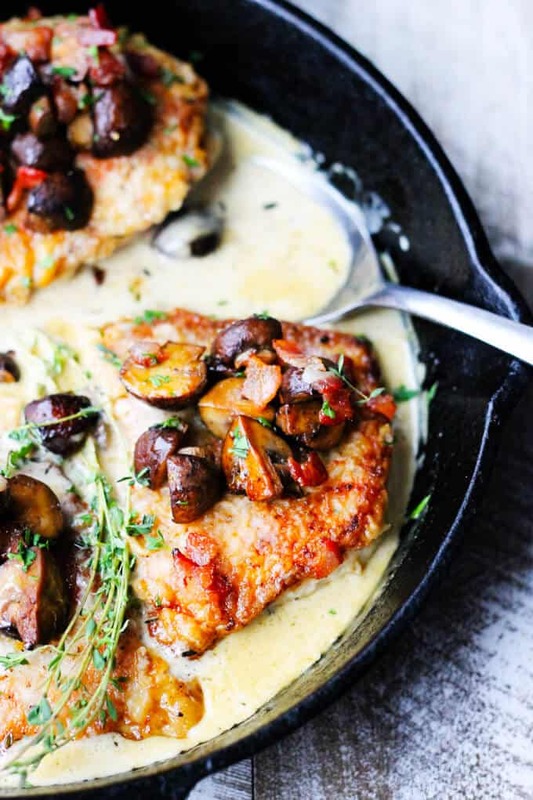 Top your pork chops with mushrooms and bacon and serve. Enjoy. This post is sponsored by Farm Promise. I adore good pork chops, but you are right, it’s hard to find great quality! I’ll have to try these! I love the mushroom cream sauce that you’ve made for these! Looks so delicious! I usually don’t have wine on hand for cooking, so I love that you can substitute lemon juice and chicken stock. I bet the bacon adds such great flavor! Thanks Vicky, you can substitute wine; and yes, bacon adds nice flavor! I just want to lick the screen looking at the pan of sauce omg it looks heavenly delicious! Wow, this recipe sounds amazing! Not to mention how it looks — scrumptious! Thank you very much Valentina! My husband and I no longer eat meat regularly, but just yesterday he was talking about his love of a great pork chop, and how he still would love to eat one here and there. 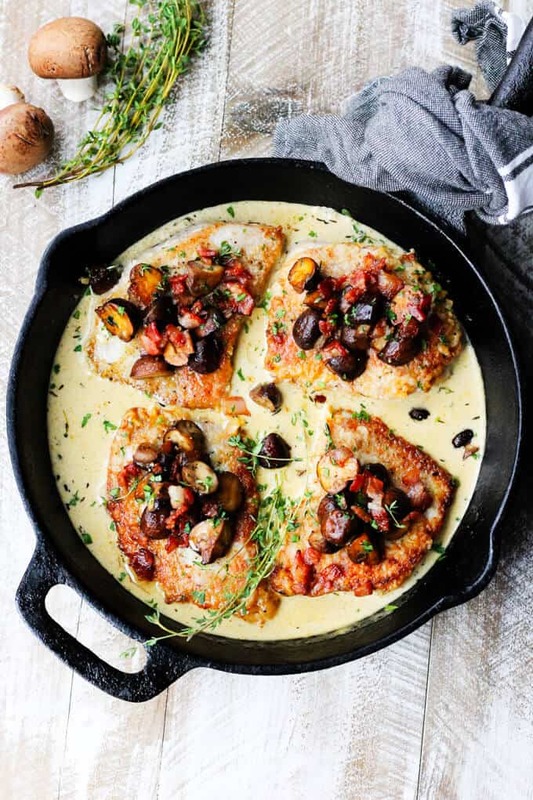 Everything about this recipe sounds exactly like something he would absolutely love – right down to the brining of the chop. I can’t wait to surprise him with this dish one night! This looks sooooo good! Yummy! This made me drool. Cannot wait to try this. Is good food and this looks like one of the BEST!! Thank you so much Veena! It looks so rich and delicious. It would be perfect for entertaining. Where oh where was this recipe when I ate pork?? However. I think that sauce could be great with the right fillet of fish. Or seared scallops. I’m gonna have to play, because it looks and sounds ridiculously good. Oh, my! 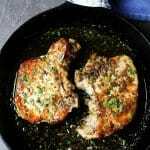 These pork chops look absolutely mouthwatering! I love the flavor combination, I bet that white wine cream sauce is amazing over mashed potatoes. Yum! Yes, the sauce tastes super delicious over mashed potatoes. Do you need to rinse the pork chops after they brine? You don’t have to but you can. It was in a brine for 30 minutes, you just pat it dry. If it was for couple of hours, you can rinse off the brine.